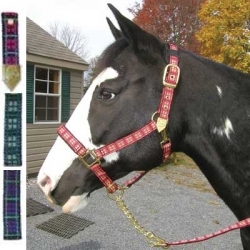 Plaid Nylon Padded Halter Top quality halter that features solid brass hardware, metal tip and brass eyelets , adjustable chin and swivel snap on rolled throat. PVC foam padding on the crown and nose prevents rubbing. This is a great halter. Available in four different plaid colors: Hunter Green/Burgundy Hunter Green/Tan Navy/Red Red/Tan Sizes - Large Horse, Horse, Cob or Yearling.